About New Dominion Exteriors, Inc.
As a local family owned and operated small business, we at New Dominion Exteriors strive to offer excellent customer service. We have gained our experience through extensive hands-on consulting & project management for major nationwide restoration companies with 30 years of combined experience. We have performed many major commercial projects nationwide, as well as thousands of residential properties. Our goal is to provide our clients, whether its homeowners, contractors or property management companies with a straight forward and professional service from the beginning of the job through completion. We will always follow up to make sure that there is 100% satisfaction with all our clients. Customer service is our objective and we always do our absolute best to ensure that our work, as well as our clients are managed with the highest level of service. 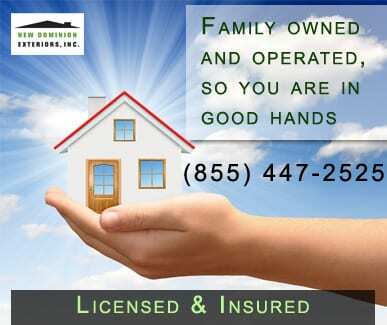 We specialize in insurance claim restoration as well as residential and commercial remodeling. Our years of experience have enabled us to master the proper techniques that are required in both roofing and siding. These techniques are not only important for aesthetics but also for the proper function of your roof or siding systems. Our installers are true professionals, with literally a few thousand builds under our belts. NDE Inc. is fully insured, carrying a $2,000,000.00 liability policy along with a $500,000.00 workman’s comp policy. We are also registered with the Better Business Bureau, reviewed on Angieslist.com and Yelp.